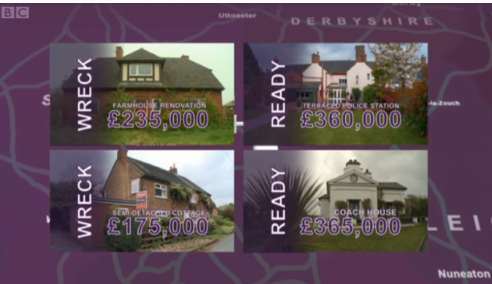 Wreck or Ready is a new property program on BBC1. Property experts Jonnie Irwin and Jane Farnham hunt for run-down renovation projects and already-perfect homes to tempt buyers looking to relocate. Episode 1/15. Jonnie and Jane help beekeeper Tony and his wife Pauline in Staffordshire. They've only viewed 8 houses and can't decide whether to buy a project or a finished house. It sounds like a good excuse to go and look at loads of properties to me! They show 4 properties - 2 of each. I'm not sure the last one of the "ready" was really as ready as it could have been. They pick the "ready but not ready" one. It needs some major work and it's the most expensive. They don't put an offer in on it though.